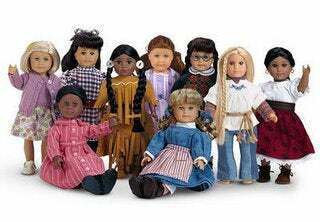 Which American Girl Doll Did You Have? In conjunction with this morning's article about some of American Girl's more diverse dolls being phased out of the Historical Collection (let's be real here—unless you customized one to look just like you the Historical Collection is the best part), I thought I'd start a more inane conversation on GT about what doll(s) you had growing up. Which doll did you have? If you had more than one (I once nannied a little girl who had every historical doll and possibly a couple of modern ones too. She had like eleven dolls! It was ridiculous. ), which was your favorite? And most importantly, why? What is it about that doll that appeals to you the most? When I became aware of American Girl dolls, I was instantly drawn to Josephina, and after some begging I got her for Christmas one year. I thought she was the prettiest doll with the prettiest clothes, but I was also fascinated by details like the way her family celebrated Christmas and the way she made bread in an adobe oven (one of the few accessories I got). I had some of the books as well and I just found her an inspiring character. And check out that gorgeous teal skirt! At the time I had just done this big Colonial America unit in school, so I was bored with that and didn't want a Colonial doll. And I was never into pioneer stories—I found the degree of rusticity dull and miserable-sounding. So Kirsten and Felicity didn't appeal to me at all. ETA: A lot of people seem to get the doll that looks like them...I looked the most like Kit but she was introduced after I already got Josephina so I never got her. I actually didn't want Kirsten, the other blonde doll, at all though. Maybe being blonde-haired and blue-eyed and already having a million blonde Barbies made me feel like I was already plenty represented. But I honestly thought Josephina was way prettier than the blonde doll was, so...?